I thought I would share some of my Journey while it is still fresh on my mind.... Please keep the below in the following context: I am in my 40’s, I work 55 Hours a week, and I have a wife and 2 kids – BUSY BUSY!! I spent a couple of weeks researching various providers before I settled on the PM PrepCast and compared several of the prominent “prep” providers; but in the end I selected the PM PrepCast as my main educational tool, and it proved to be a good decision. I purchased the PrepCast, the Simulator, and the Formulas from Cornelius. Here is the list of materials I utilized. PrepCast Vids: You can watch these at 1.3X to 1.5X normal speed. Exam Simulator (From PrepCast): I can not say enough good things about the simulator – Just buy it. Formulas (From PrepCast): I would get these also, for the cost, they have everything neatly organized for you. PMBOK: Yes, you need it. Rita Mulcahy’s Book: Totally Optional. I bought this, scanned it a couple of times, but did not focus on any of it. It is a good resource though, and I like the layout. Cynthia Snyder Dionisio’s Book, A PM’s Book of Forms: Again, optional. I like having it though. There’s nothing like being able to quickly look up what a Resource Breakdown Structure looks like. PodCast Addict (To watch the PrepCast): It works well, or use your own favorite Podcast player. PMP Exam Mentor (Android App): While this app didn’t become my favorite, it was a nice little tool to use when I only had my phone and a few available moments. Example, I was at the DMV and had to wait an hour to be seen….I ripped through 50 questions on the app. Ricardo Vargas’ Process Flow vid on YouTube: This is an excellent place to start. He breaks down the process flow and helps you get an initial grasp of workflow. Aileen Ellis’ vids on YouTube: These are great, and another perfect downtime activity. She also has a good group on FaceBook – Join it! She offers free classes once a week, you will find out about them when you join her group on YouTube. PMBOK PDF: This is essential. If you purchased the PMBOK, then you should have received the PDF version. I used this ALL THE TIME to quickly look up topics. If you are time-strapped like I am, plan 5 to 6 months prep time. Start by watching Ricardo Vargas Process Flow video on YouTube; this get you thinking about how the Processes interact. The most productive study time I had was while I was eating a sandwich at lunch time during my work day. Because that was “quiet time”, I read the entire PMBOK over my lunch periods. The PMBOK, yes, you need to read it. 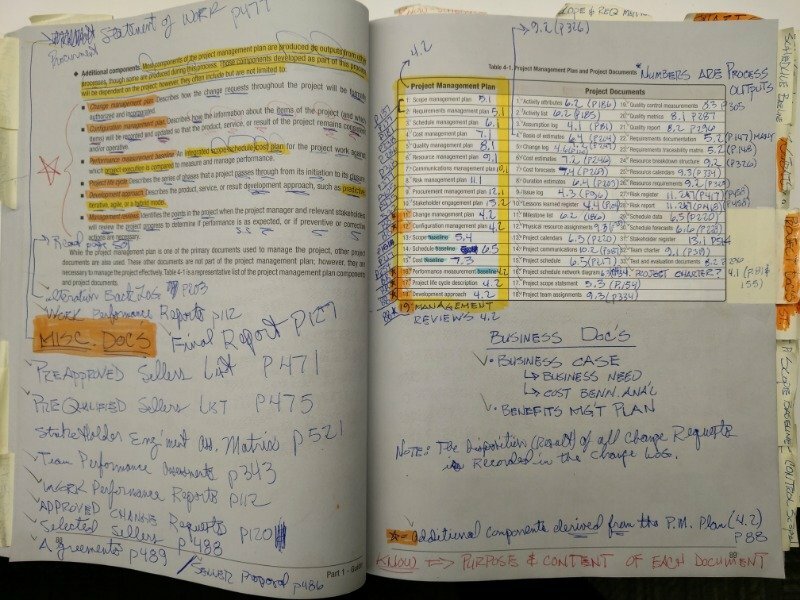 Read the PMBOK completely one time through and outline it like you would a college book. Pay attention to page 89. This lists the different documents. Outline this page with where the documents are located in the PMBOK and note what Process they come from – See Attached. Also note, there are more documents than the ones listed on this page – Know them. Regarding the PrepCast vid’s, you can multitask these. I spend two hours a day commuting, so I listened to the vids on the way in and then back home. I did not have the time available to dedicate this activity to “home duty”. Make the process map and formula dump sheet once per day until you know it COLD. Once you complete the PMBOK, Vids, and the Formulas, then start the Sim tests. Let me make this clear: THE SIM TESTS ARE WHAT YOU NEED TO MASTER TO PASS THE EXAM. I can’t make it simpler than that. The sim tests offered by PM PrepCast are VERY VERY SIMILAR to what you will see on the exam – See Below. TAKE ALL THE SIM TESTS offered by PM PrepCast. Pay extra attention to the explanations offered by the Prep Team contained within the questions – This will accelerate your understanding. I did not read the Agile book that comes with the PMBOK. The Prep Team and the question Sims got me prepared enough for the Agile test questions. When you are studying, think about how the pieces go together and “what comes next” – A LOT!! Example, this this and this happened, as the PM, what do you do next? This This and This happened, what document do you file next. - There were about 5 Agile related questions. - There were about 6 calculation questions. - There were about 2 network diagramming questions. - There were about 6 questions that covered Tools and Techniques. - There are numerous questions covering Inputs and Outputs. - I would say 1/3 were very long winded questions (4 to 5 sentences), 1/3 were 2 to 3 sentences, and 1/3 were 1 to 2 sentences. Be Mentally Prepared for the long questions!! - There where many questions that asked, “what do you do next” and “what document do you file next” and “what document do you look up for what info” and “when do you execute said document”. This is not like any other test you have taken before. Why? Because the questions can be long, situational, and the answer choices are ALMOST ALWAYS similar. Yes, you can usually eliminate one or two of the answer choices, not always. Start the exam by brain dumping the formulas – This should take you no more than 60 to 90 seconds. I also brain dumped the Process Chart, but I only “dumped numbered” the Processes (I did not identify them by name, just that this Process intersection has X number of processes – By the time you take the test, you will know their names and where they are all located in the grid). I had no extra time at the end of the exam, in fact I had to rush the last 20 questions. That’s because I am contemplative by nature and not a very quick reader. I did take one very short break. Bottom line, KEEP MOVING through the questions and monitor your pace as to not fall behind on time. It’s not published, but you probably need a 68% to pass the test. Therefore, if you are scoring over 70% on the sims, you should squeak through. Shoot for approx. 80% on the sims to be safe. Good Luck!! Put your time in and follow the above and you will be fine. PS - Thanks to Cornelius and his team for putting this course together!! And Yes, I passed the Test on 11-26-2018. Mohammad Taher, you are welcome. Good Luck!